"Inner Gesture" is only $10.00CAN plus shipping and taxes where applicable! A variety of styles and soundscapes from Peter DiPhillips. 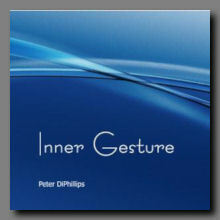 "Inner Gesture" by Peter DiPhillips is a collection of four loop-based songs blended together in a long form mix that addresses a wide range of styles and moods. Moving from modern cityscape soundtracks through abstract tonal funhouses to panoramic musical vistas, "Inner Gesture" creates a virtual travelogue for the listener, a trip through a new sonic landscapes. "Meditation To" opens the disc, a pulse-driven track where a steady beat is created through a thick bassline. Chimes and synths add colour to the track and lightly brushed percussion play throughout providing a sense of movement and travel. It's a very urban sound, a track that brings to mind late nights while the city sleeps, the sounds of back alley lounges and rainy side-streets. "Meditation Won" segues in from the last track with some of the same tones and melodies blending in with a new tonal palette that ultimately takes the sound in new directions and spaces. The track bounces through a variety of tones, shifting abruptly in points and turning in on itself at times, almost like a Moebius loop. It's a bit of a challenging listen, but an ultimately rewarding one. "New Image" mixes seemlessly with the last track, a long form piece where slow synth pads drift through the soundfield punctuated by irregular sonic extras that rise and fall. Shakers, saw lines, a short drone, others, all tastefully chosen and carefully placed sounds that add character to the track. There's a definite feeling of space in the track, not so much cosmic as expansive, the feeling of a wide open environment where distances meet the sky. A really nice piece of music. "Slow Rays" follows without pause, a dense mixture of tones that blend together nicely. Melodic lines and tones bubble up through the soundfield, creating an ever shifting kaleidescope of sound. It's difficult to pick an anchor out of the proceedings, but it all works well together. I always enjoy finding new artists and I'm quite pleased with the discovery of Peter DiPhillips. His work has an engaging approach to song forms and displays a clever sense of humour that runs throughout. I like this disc and I look forward to seeing what DiPhillips comes up with next.